I will say that I am biased. I have driven this 1975 Volvo C303. I have taken it through traffic. I have bombed the highway in it. I have attempted to go wheeling in it in a quiet corner of Brooklyn. It is military-grade and tough beyond measure. And now it’s for sale. This is Blipshift’s C303. 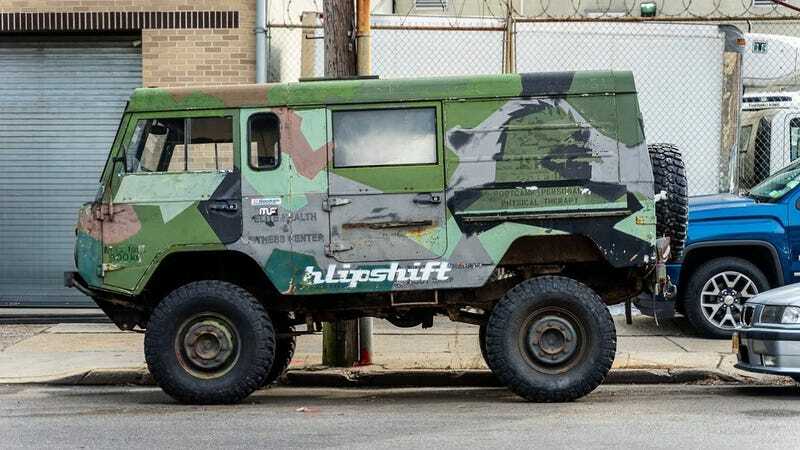 Again, to explain some bias, Jalopnik has worked with Blipshift in the past designing some shirts and hosting some events, which is how I know them, and how I got to get behind the wheel of this thing. It’s an ex-military vehicle, and was told it was the kind of thing used for recon up near the border with Russia during the Cold War. The very cold part of it. There are bigger trucks. There are beefier trucks. But there are few trucks that are this tough and this rugged in this compact of a package. It’s a forward-control vehicle, so you sit above and beside the straight-six gas engine rumbling away, driving all four wheels with locking diffs and high-riding portal axles. It is fun to take highway bumps at 45 miles an hour in? No! Is it fun to drive up small flights of stairs? Yes! Photo: Raphael Orlove w/ Andrew Collins keeping a very cautious hold of the wheel. The asking price is $9,500 on New York Craigslist which seems like a steal versus whatever people are overpaying for on Bring A Trailer at the moment.